Guest art by Ryan Hill. You only have two more days to get June’s shirt of the month: Three Wolverine Moon, by Tyler Crook! Protect yourself from goose attacks. ART CHALLENGE: Design a new graduation costume for one or more of the New Mutants! 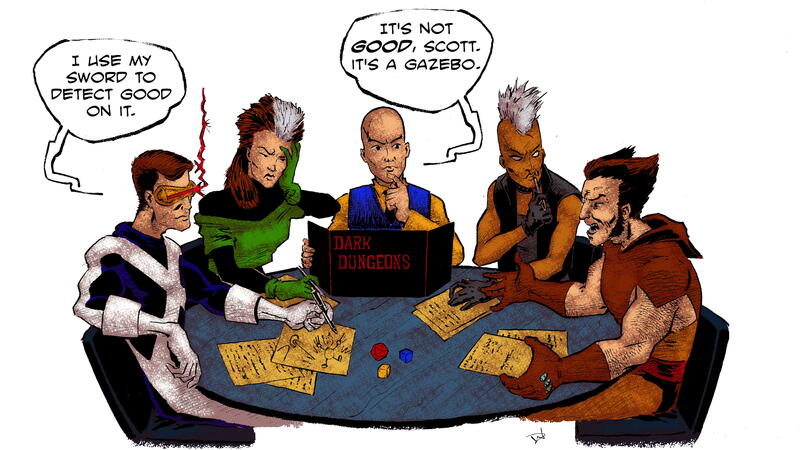 Send your designs to xplainthexmen(at)gmail(dot)com, with the subject line GRADUATION, and we’ll collect ‘em on the blog at the end of the week! Guest art by Ryan Hill! 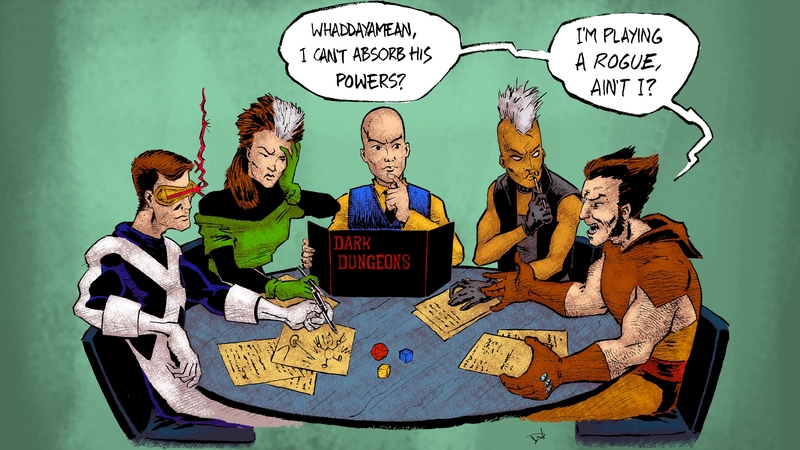 In which cartoon logic is terrifying; it’s immensely frustrating to be Doug Ramsey; Psylock gets evil robot eyes; queer subtext is not just for the ladies; Danger Room cold opens are the new Kitty’s costume changes; Mojo predicts reality TV; Longshot joins the X-Men; and we answer what may be the best question we have ever gotten. Special thanks to Ryan Hill for this week’s art, and to Claire Miller for the research X-Pertise! In which the fact that we’re biased doesn’t mean we’re not also right; we disagree about which Silent Hill game makes the best metaphor for E is for Extinction; and Miles probably does not actually have the Legacy Virus. You can (and should) buy the Three Wolverine Moon shirt here until July 1, 2015. Art by David Wynne. Prints and cards available until 6/28/2015 in the shop, or contact David for the original. Because we are gluttons for punishment, we let you choose which characters Rachel & Miles would play, and the makeup of the party. Tina Abate (Wolverine) splits her time between an office job; working administration for Rachel & Miles X-Plain the X-Men; and blogging about the adventures of Jennifer Walters, the world’s greatest lady lawyer, at jenniferwaltersesq.tumblr.com. She lives in Portland and wishes there was a way to monetize atrocious Wolverine impressions. 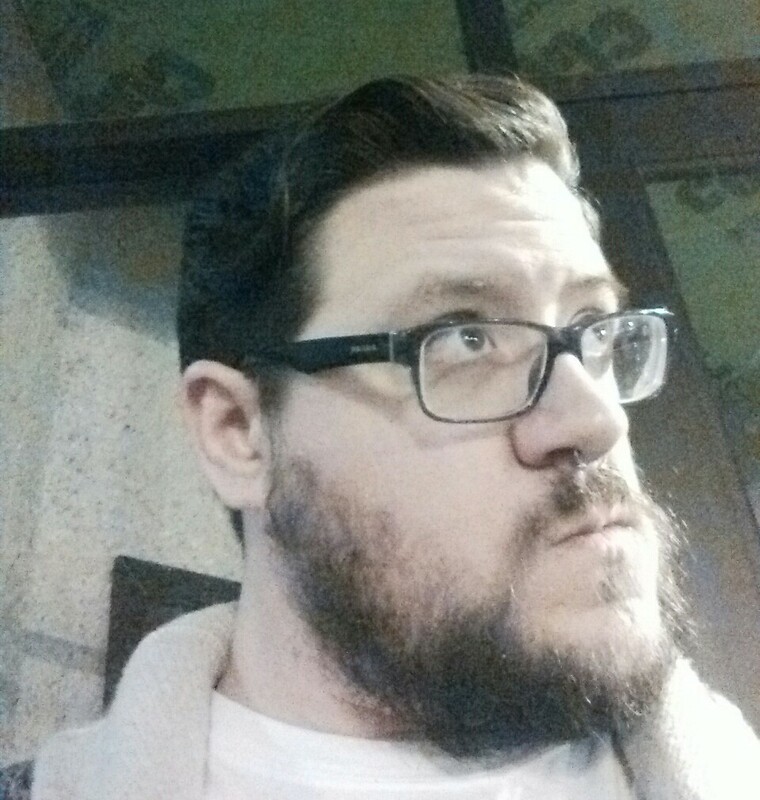 Mikey Neilson (Storm) is the founder and co-host of the Chronicles of the Nerds podcast. For the past 6 years he’s been yelling his opinion about everything from X-Men to Power Rangers on a weekly basis. Mikey is also the Programming Director of the Rose City Comic Con, which will be having it’s 4th year on September 19th and 20th. When not talking nerd, Mikey can be found in a dark room writing comics no one will ever read. Rachel Edidin (Cyclops) was really hoping to play Beast, but acknowledges that this is a hole she dug for herself. Miles Stokes (Rogue) has seriously been talking in that accent all week. NEXT WEEK: Get ready to walk the Wildways! 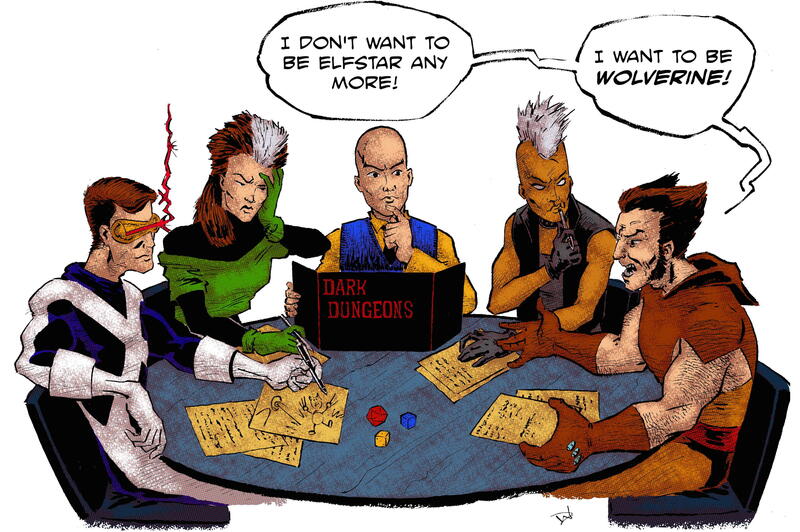 In which we welcome Logan Bonner, Mikey Neilson, and AdministratriX Tina to the gaming table for an original X-Men Animated Adventure; the real enemy is BS&P; Australia is kind of terrible; Rogue is concerned about kangaroos; Wolverine taps into the power of love; Storm makes a long-distance call; and Cyclops plans for failure (but not color-coded labels). NEXT WEEK: Walking the Wildways! In which force lightning is probably gratuitous, Old Man Logan continues to be intriguing, and we continue to be huge dorks. Dani Moonstar has never been my favourite X-man. Don’t get me wrong, I really like her, but never as much as I’ve wanted to, or felt like I should. After all, she’s aboriginal, and I have a vested interest in good representation of that broad group, in all its multitudes. I’ve even written about it recently. But… Dani is complicated, and so is my relationship with how she’s developed. Because the thing is, there is a lot to like about her, especially in her history as a character. It starts right at her appearance; after my Red Wolf article at ComicsAlliance, which was heavily critical of the costume design, some people asked me what I thought was a good example of an indigenous superhero’s costume, or if it was possible to design an indigenous character’s costume in a way that still reads as indigenous without delving into pure stereotype. Each time, my answer was the same: Dani Moonstar. Her New Mutants costume is classic, and honestly one of my all-time favourites, because of the way it shows that she’s just a member of a team, but uses small details, like her braids, her beaded necklace and original turquoise belt, to also signal that she’s Cheyenne. A costume of nothing but those elements would be an awful stereotype, but that costume, for me, hits the exact right balance. Her bow and arrow – something that reads a little too cowboys-and-injuns for me – is another case, but her outfit is a smart blend of cultural representation and X-uniform. Similarly, her mutant abilities were (and that tense will be important later) a smart balance of stereotype – talks to animals, to oversimplify it – and subtlety – empathic psi talent. Her mutant abilities managed to communicate her indigeneity without screaming the standard lines of “Ancestors!” and “Connection with the land!” Not that this is necessarily inaccurate, of course. Many North American aboriginal cultures emphasize a respect for tradition and a relationship with one’s land as part of a healthy life. Again, it’s when that becomes the only focus that you get things like a commercial with a Native American crying a single tear over litter. What’s missing in those representations is they key aspect of those aboriginal cultures: reciprocity. Relationships between people, or between them and their environment, and the corresponding sets of responsibilities that come with them. Dani, as an empath, was a fantastic literalization of that metaphor of reciprocity, in a wonderfully comic book-y way. Empathy is a key element of reciprocity, after all. Her abilities were an extension of her culture, but in a way that were simultaneously on-the-nose and opaque enough to allow her indigenity to be reflected, but not stereotyped. Her mentorship of a new New Mutants team in New X-Men was even a nice extension of her empathy and reflected a bit of the matriarchal Cheyenne society. That all sounds great. That doesn’t sound like the grounds for a complicated relationship with the character at all! But there are a few wrinkles, the first and most prominent of which is the fact that Dani isn’t just a focal representation of the Cheyenne people. She’s also Hel’s Valkyrie. This spun out of the events of 1985’s New Mutants Special Edition, where Dani was originally selected as one of Odin’s Valkyries, which presents a potentially sticky topic of whitewashing, at least metaphorically. Marvel’s Norse mythology isn’t a direct translation of the real-world myths, and there are people of colour represented within it, but even a cosmic, superheroic version of a culturally caucasian set of stories is still somewhat representative of it, and there is a real possibility, when introducing a character of a less vividly or saliently represented culture to it, that it can swallow the “smaller” culture. It’s a tricky thing, and for the original New Mutants volume’s part, it did try to balance the macro-level discomfort with a micro-level exploration of character and these two sets of culture. New Mutants #41, discussed on this week’s episode, features Dani recentering herself in her community and culture after becoming a Valkyrie, and it’s a welcome diversion (in an arc of single-issue, character-oriented diversions) that does a lot to accommodate both halves of Dani’s character. Even the issue of the conflict of cultures and theologies is explicitly tackled by 1993’s Marvel Comics Presents #121, where one of Dani’s Cheyenne deities, Hotamitanio (representing the Cheyenne’s value of fierce guardianship and self-sacrifice), is angered by Dani’s decision to stay in Asgard as a Valkyrie in New Mutants #87 three years earlier. The issue presents a literal negotiation by Dani with her heritage, wherein she promises to return to her tribe eventually. Figuratively, it presents a common internal debate many aboriginal people have, particularly when they are of mixed heritage. Where do I belong? What does it mean for my aboriginal identification if I engage with the other part of myself? How do I balance my relationships to tradition to membership in an urban population? These are real issues, being negotiated by an aboriginal character in a popular medium, in a splashy, figurative way that superhero comics have always done so well. It’s important, and it rings true in an emotionally valid way. It’s also drawn by Joe Madureira, so it’s pretty fun to read, too. That negotiation with Hotamitanio is based on that idea of reciprocity that is so integral to Dani’s character. It’s okay to do one thing, to belong to these other groups, if she values her responsibilities to her family and her people. It’s a tenuous, modern conclusion that’s based on an if: Dani’s engagement with her aboriginal heritage. And here lies the second wrinkle with the representation of Dani Moonstar: M-Day and the mutant Decimation. At the end of House of M, when the Scarlet Witch utters, “No more mutants,” and depowers all but approximately 200 of the Marvel Universe’s mutants, Dani is left without her empathic psi abilities. On the surface, her predicament isn’t that different from any number of other mutants, who are now forced to re-examine their place in the world as baseline humans. 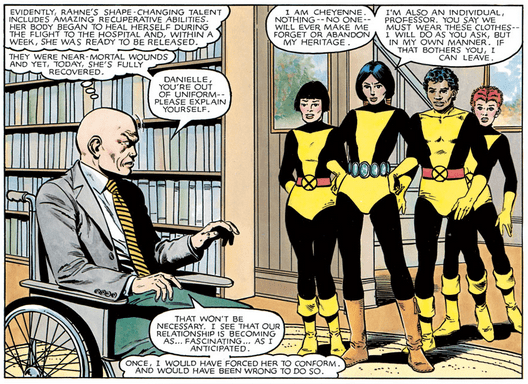 However, with Dani’s powers being so tied into her cultural background, a depowering like that not only changes how she engages with her role as an X-man, but it changes a fundamental aspect of how her indigeneity is reflected on the grand level of mutant metaphor. A character whose powers were subtly tied into her Cheyenne heritage is now more tenuously tied to it, especially when some artists might not consistently represent her racial features outside of her skin tone. Even this wouldn’t potentially be too sticky an issue – and could potentially present an opportunity for examination of how a character’s relationship to her heritage changes over time – if it didn’t combine with her nature as a Valkyrie and, as of the Utopia storyline, a Valkyrie of Hel. As explored, neither change in status is in itself inherently a disservice to Dani’s indigeneity, but together they interact in a compounding way. Part of the success of Dani’s initial transition to being a Valkyrie was the way it balanced with her aboriginal heritage, explicitly with Hotamitanio and implicitly with her mutant abilities rooted in the tradition of reciprocity. But with those powers removed, it upsets the balance of that cultural negotiation. It leaves Dani as, primarily, a Valkyrie, more tied to a primarily white culture than her own. Whatever colour her skin is, it leaves the bad taste of whitewashing for me. This whitewashing has been exacerbated by the way Dani’s character has been treated by Marvel and its creative teams since. After all, she’s a member of a team whose whole deal is that they have superpowers as part of who they are, and as a result, much of her involvement with the Marvel Universe tends to rely on her powers. Currently, that means her involvement relies on her as a Valkyrie more than anything else. In the New Mutants (Volume 3) tie-in with the Fear Itself event, Dani is a prominent character, but her reason for being involved with the plot is that she’s Hela’s Valkyrie. She’s part of the event because she’s been absorbed by the Norse side of her background. Similarly, Dani is a prominent character in the 2013 Fearless Defenders series, but because the series’ premise is rooted in the character of Valkyrie (Brunhilde), Dani ends up being brought in – kidnapped into it – because she’s a Valkyrie of death. The only nod towards her aboriginal heritage at all is in Issue #9, when Dani responds to Hippolyta suggesting that some skull sculptures “bear resemblance to the totem poles of your culture,” and Dani responds by jokingly suggesting that Tapout t-shirts represent Amazon culture. It’s a fun joke, but as the only nod to her aboriginal background? It’s a joke, but not representation. The whitewashing effect is heightened by the fact that Dani’s superhero costume is now primarily her Valkyrie costume, whose armour and multi-pronged helmets visually swallow up aboriginal signifiers like her necklace, or recontextualize ones like her braids. In treatment, both by script and art, Dani is primarily defined by her ties to a white culture, with little of her promise to Hotamitanio remaining. Unfortunately, this is where I came in. 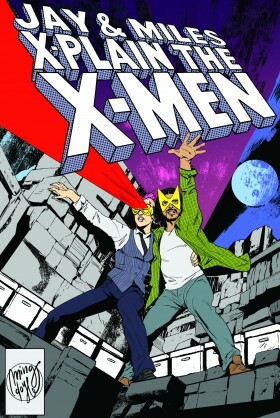 I started reading X-Men comics post-Decimation during the Endangered Species storyline. My primary reference point for Dani, one of comics’ previously greatest aboriginal superheroes, isn’t her heyday in the New Mutants. It’s her life as a Valkyrie, and it colours a lot of how I think of her. My relationship with Danielle Mooonstar isn’t defined by her as an aboriginal person, because Marvel has long since stopped treating her like one in any significant way. I wish I could think of her the way Rachel and Miles do, as one of the most nuanced X-Men and a representative of a storied era of comics. But I can’t, and it makes me sad. How many new readers know of her as an aboriginal person, or know about how she used to represent the matriarchal tradition of reciprocity? Do they even know she’s aboriginal at all, or do they just see her as “brown?” This is that macro-level whitewashing in action, and it needs a new coat of paint. James Leask is a Metis writer and researcher interested in exploring modern indigeneity and representations of aboriginal peoples in media. In Episode 61, we answered a listener’s question about Autistic1 characters and neurodiversity in X-canon, and I want to take a moment to elaborate on a couple things I brought up there. Nothing formal, mind: this is both a bit of a ramble and significantly more personal than I usually get here. Consider yourselves warned.